Complex socioeconomic, ecological and governance factors contribute to the cause of fires, and the solution. Asia Pacific - BOGOR, Indonesia — Fires in forests and former forest lands occur in Indonesia in the dry season every year, particularly in the provinces of Riau, West Kalimantan, Jambi and Central Kalimantan. The haze that spreads to other countries is mostly caused by fires on peatland. Fires begin and spread for many reasons, so it is misleading to think of “fires” as the problem – or even as a single problem. Complex socioeconomic, ecological and governance factors are involved, meaning that the problem – and the solutions – go beyond who actually lights the match. Most fires are deliberately lit. Some then escalate and get out of control. Some may have been smouldering in peatlands for months or even years. The World Resources Institute laid NASA satellite data over Ministry of Forestry concession maps in an effort to identify the sites. CIFOR also made an analysis of satellite imagery for the area in Riau Province, Sumatra, which appears to have been worst affected by recent fires causing haze problems over Sumatra, Singapore and Malaysia. While several recent assessments have used NASA’s daily fire alerts to locate the fires, CIFOR additionally used higher-resolution imagery from the recently launched Landset 8 satellite to map fire scars. For local communities and smallholder farmers, fire is a cheap and effective tool for clearing land for slash-and-burn agriculture and to access swamps. Extreme weather events, such as ENSO (El Niño–Southern Oscillation) events and prolonged droughts, make areas more prone to fires. Large-scale developments, such as oil palm and timber plantations, also make the landscape more prone to fire by degrading the land through logging and drainage. For example, logged-over forests suitable for conversion to oil palm plantations are more susceptible to extensive burning. Indonesia’s forest moratorium, just renewed for two years, prohibits authorities from issuing new permits for development on peatland. However, conversion to oil palm plantations can go ahead for concessions already awarded; some of these are on peatland. Companies seeking to be compliant with Roundtable on Sustainable Palm Oil requirements must not use fire in their field operations; compliance is important if these companies want to sell their palm oil in eco-sensitive markets such as the European Union. The smoke haze in Singapore and elsewhere is generated mostly by fires on peatland. Smoke from fires in other land types is a less significant contributor. The haze may be caused by peat fires recently lit, or by fires lit long ago that smoulder and reignite. In particularly dry years, the peat below ground also catches fire and it smoulders for months. The haze lingers because the fires do too. Fires are in peat around 3–4 m underground. Firefighters have to stick a hose into the peat to douse the fire. Peat fires are a major contributor to emissions from Indonesia. According to Indonesia’s Second National Communication to the U.N. Framework Convention on Climate Change (UNFCCC), greenhouse gas emissions from peat fires increased from 172,000 Gg CO2-eq. in 2000 to 451,000 in 2005. 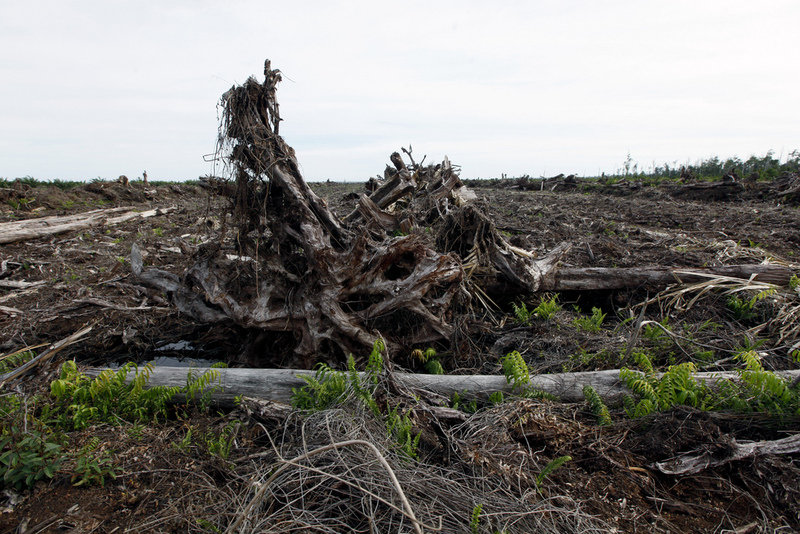 A 2009 assessment from Bappenas (Indonesia’s National Development and Planning Agency) suggests that, between 2000 and 2006, Indonesia’s peatland greenhouse gas emissions from fire, peat oxidation and loss of aboveground biomass through deforestation amounted to an average of 903,000 Gg CO2 annually. Another estimate puts the carbon release of the 1997 fires at 1.45 Gt, equivalent to 0.73 ppmv of CO2, or almost half the annual global atmospheric CO2 growth. What is the relationship between oil palm and the 2013 haze crisis? The current haze crisis is, at least in part, caused by the clearing of land for plantation estates. According to the World Resources Institute blog, 20 percent of the fires from 12–20 June 2013 were in oil palm concessions, based on satellite data from NASA mapped onto the Ministry of Forestry’s concession maps. How much is the haze crisis likely to end up costing? For the 1997/98 fires, an estimate by WWF and the Environmental Emergency Project (EEP) of the Indonesian Ministry of Environment arrived at figures of more than $ 6 billion. Based on the 2004 carbon market price, emissions from the 1997 fire episode were worth around $ 3.6 billion. What can be done to avoid the situation repeating itself? Impose and enforce bans on fires on peatland. Indonesia has the technology and the enforcement capacity to do so. Improve spatial planning to protect peatland and other high-carbon-value forests. This would help Indonesia achieve its policy of “green growth with equity”, balancing economic growth with improving protection of the environment. Rehabilitate peatland, which is the best way to prevent fires and peat decomposition (also a major source of carbon emissions), because wet peat does not burn or decompose. Continue the forest moratorium and extend it to cover all peatlands. Ensure that any developments involving large-scale land-use change take place only on land that is already degraded/deforested. Use remote sensing technology, digital mapping and instantaneous communications to support efforts to predict, detect and respond to potential fire crises; to prevent unwanted fires; and to support enforcement of burn prohibitions. Support all levels of Indonesian government in working together to strengthen law enforcement. Singapore and Malaysia are the headquarters of many plantation companies operating in Indonesia. As the Singaporean Prime Minister has been saying, those governments can help Indonesia’s government by ensuring that companies, and the contractors they employ, respect the law, paralleling Indonesia’s responsibility for Indonesian companies. Companies, wherever they are based, are usually considered to have a corporate responsibility. For example, the Consumer Goods Forum (CGF) – a global network of the major consumer goods businesses, including those that use plantation crops planted on peatland – has committed in its Tropical Forest Alliance with the U.S. Government to zero net deforestation by 2020. The CGF could take a strong position against the conversion of peatland. Consumers could demand that their palm oil and paper is not grown on peatland, or on sites that were converted therefrom. Banks and international finance institutions that lend money to plantation corporations could ensure their sustainability commitments (e.g. World Bank & International Finance Corporate follow the Sustainability Framework; private banks follow Equator Principles) recognize the issue of haze as a serious environmental problem. Support initiatives such as Australia’s Kalimantan Forest Carbon Partnership, which is learning how to restore degraded peatlands to make them much less susceptible to burning. Unblock international climate negotiations to support implementation of REDD+, which can provide an alternative income stream to landowners and communities, so that they can improve their livelihoods without converting forests.